Given the importance of spoilage caused by Alicyclobacillus acidoterrestris for the fruit juice industry, the objective of this work was to study the germination and inactivation of A. acidoterrestris spores induced by moderate hydrostatic pressure. Hydrostatic pressure treatment can induce the germination and inactivation of A. acidoterrestris spores. At low pH, spore germination of up to 3.59-3.75 log and inactivation of 1.85-2.04 log was observed in a low pressure window (200-300 MPa) applied at 50ºC for 20 min. Neutral pH suppressed inactivation, the number of spores inactivated at pH 7.0 was only 0.24-1.06 log. The pressurization temperature significantly affected spore germination and inactivation. The degree of germination in apple juice after pressurization for 30 min with 200 MPa at 20ºC was 2.04 log, with only 0.61 log of spores being inactivated, while at 70ºC spore germination was 5.94 log and inactivation 4.72 log. This temperature strongly stimulated germination and inactivation under higher (500 MPa) than lower (200 MPa) pressure. When the oscillatory mode was used, the degree of germination and inactivation was slightly higher than at continuous mode. The degree of germination and inactivation was inversely proportional to the soluble solids content and was lowest in concentrated apple juice. Alicyclobacillus acidoterrestris, thermoacidophilic and spore-forming bacteria may cause spoilage of pasteurized juices and beverages, producing compounds associated with a disinfectant-like odour: guaiacol, 2,6 – dibromophenol, 2,6 – dichlorophenol (Baumgart et al., 1997; Borlinghaus and Engel, 1997, Pettipher et al., 1997; Orr et al., 2000; Jensen and Whitfield, 2003; Gocmen et al., 2005; Niwa, 2005; Danyluk et al., 2011). These bacteria have been isolated from orchard soil (Eguchi et al., 2001; Goto et al., 2008; Groenewald et al., 2008; Wang et al., 2010), fruits (Eguchi et al., 2001; Parish and Goodrich, 2005), juice production environment (Eguchi et al., 2001; Steyn et al., 2011, Zhang et al., 2013) and from many final products – juices and juice concentrates, all over the world (Cerny et al., 1984; Splitstoesser et al., 1994; Baumgart et al., 1997; Pettipher et al., 1997; Eguchi et al., 2001; Durak et al., 2010; McKnight et al., 2010; Danyluk et al., 2011; Oteiza et al., 2011). The presence of this new type of spoilage bacterium in aseptically packaged apple juice was first reported in 1984 (Cerny et al., 1984) and since then A. acidoterrestris has been recognized as a significant spoilage organism in the fruit juice industry (Silva et al., 2000). A. acidoterrestris strains show the ability to germinate and grow at a pH range of from 2.0 to 6.0 at a temperature of 20-55ºC, with an optimum range of 42-53ºC (Baumgart et al., 1997; Deinhard et al., 1987; Sokołowska et al., 2010). A. acidoterrestris contains ω-cyclohexyl fatty acids in its cellular membrane composition. These ring structures are of special physiological importance for cells at a high growth temperature and low pH (Kirschke and Poralla, 1990). A. acidoterrestris spores show extremely high thermal resistance depending on the kind of juice, its soluble solids content and pH. The values of D95 (time in minutes, during which the number of living cells decrease by 90%, at 95ºC) in various juices that can be found in the literature were 1.85-15.1 min (Splittstoesser et al., 1994; Baumgart et al., 1997; Komitopolou et al., 1999; Silva et al., 1999; Bahceci and Acar, 2007; Sokołowska et al., 2008; Bevilacqua and Corbo, 2011). The standard pasteurization process using temperatures of 85-95ºC, which is aimed at destroying vegetative pathogens, is therefore ineffective against these bacteria spores (Splitstoesser et al., 1994; Baumgart et al., 1997; Silva et al., 2000). Using a higher temperature can negatively affect the nutritious and sensory quality of the juices, therefore there are attempts to use hydrostatic pressure (HP) as a non-thermal spore-inactivating process. A few studies report A. acidoterrestris vegetative cell and spore inactivation by HP (Lee et al., 2002; Alpas et al., 2003; Ardia, 2004: Lee et al., 2006; Vercammen et al., 2012; Silva et al., 2012; Skąpska et al., 2012, Sokołowska et al., 2012, Sokołowska et al., 2013). A. acidoterrestris vegetative cells were killed by HP when 350 MPa at 50ºC was used. More than a 4 log reduction was achieved in BAM broth (Bacillus acidocaldarius medium), orange, apple and tomato juices after 20 min pressurization (Alpas et al., 2003). It was also shown that the effect of A. acidoterrestris spore inactivation in apple juice, using pressure ranging from 207 to 621 MPa (up to 10 min), was strongly dependent on the process temperature: at 22ºC no reduction was achieved, at 45ºC a max. 3.5 log reduction occurred and at 70ºC and at 90ºC, complete (> 5.5 log) reduction was observed after 5 min treatment, irrespective of the pressure used (Lee et al., 2002). In accordance with these results are those of Ardia (2004). Previously a study by Skąpska et al. (2012), showed large differences in sensitivity to HP between the spores of eight wild A. acidoterrestris strains. The reduction in the spore number in apple juice after treating at 300 MPa for 10 min was 1.3-3.5 log, depending on the strain. Increasing the pressure to 500 MPa did not result in a significantly more efficient pasteurization process. The use of oscillatory high pressure has been proven to be more effective. The greatest reduction in spores of the two most resistant to HP A. acidoterrestris strains (TO-29/4/02 and TO-117/02) was 2.4 and 3.1 log cfu/ml when 300 MPa in six five-min cycles at 50ºC were applied. Subsequent research (Sokołowska et al., 2012) has shown that lower pressure of 200 MPa at 50ºC, applied both in a continuous and oscillatory mode, produced an even better effect. In these conditions, a reduction of 1.5 log in the A. acidoterrestris (TO-29/4/02 strains) spore count in apple juice was obtained after 10 min of continuous pressurization. After six five-min cycles a reduction of 5.0 log was achieved. A recent study carried out using orange juice (Silva et al., 2012), showed an approximate 2 log reduction in A. acidoterrestris spores after processing with 200 MPa at 65ºC for 10 min, slightly better results (~2.5 log) were achieved when the pressure was increased to 600 MPa. Only one article concerning the germination of A. acidoterrestris spores induced by HP was found (Vercammen et al., 2012). This experiment, carried out for 10 min with a pressure of 100-600 MPa, in buffers at pH 4.0, 5.0 and 7.0 and a temperature of 40ºC, showed no significant spore inactivation, although spore germination of up to about 2 log was observed in a low pressure window (100–300 MPa). When spores were treated in tomato sauce with pH 4.2 and 5.0 with 100-600 MPa at 25, 40 and 60ºC for 10 min, the germination level was generally higher than in buffers. HP treatment conducted at 60ºC resulted in the inactivation of most of the germinated spores. The inactivation of A. acidoterrestris spores under high pressure was shown to be suppressed by a high soluble solids content in apple juice concentrates (Lee et al., 2006; Sokołowska et al., 2013). No information about the germination of these spores in concentrated juices was found. Depending on the temperature and level of pressure applied, bacterial endospores pass through different physiological pathways, which could induce spore germination or their subsequent inactivation during treatment. Moderate hydrostatic pressure induces spore germination by triggering the spores’ nutrient receptors (Setlow, 2003; Reineke et al., 2012). During the germination process, spores progressively lose their typical resistance and become more readily inactivated like vegetative cells (Wuytac et al., 1998; Setlow, 2003; Moir, 2006; Luu and Setlow, 2014). The changes in spore sensitivity to heat and high pressure, which were used to differentiate the stages in the germination process in this work, were described by Black et al. (2007). In the first stage, the spores partially lose their impermeability to water, leading to an influx of water (with a slight increase in volume) and leakage of solutes (dipicolinic acid – DPA, Ca2+). Consequently, they become sensitive to wet heat (Setlow, 2003). During the second stage, the cortex is enzymatically digested, leading to full core rehydration, greater hydration of the core macromolecules, and a greater loss of spore-specific resistance, including to high pressure (Wuytac et al., 1998). At the end of the second stage, the small acid-soluble spore proteins (sasP) are hydrolyzed to amino acids, which are subsequently used in protein synthesis by the growing cell (Moir, 2006; Setlow, 2003). Protein synthesis and spore metabolism only occur in the outgrowth phase, in which the germinated spore is converted into a growing cell. According to Wuytac et al., 1998 and Reineke et al. (2012) spores are unable to proceed to stage two of germination above 500 MPa. Further spores are unable to outgrowth under pressure. A treatment pressure above 500 MPa combined with elevated temperatures (> 60ºC), could induce rapid spore germination by opening the spores’ Ca2+-DPA channels (Paidhungat et al., 2002), which is accompanied by the release of large depots of DPA and the associated divalent cations (predominantly Ca2+) from their core. The presumed direct opening of Ca2+-DPA channels are even active at 200 MPa and a moderate temperature, but this is not a dominant factor influencing the germination rate (Reineke et al., 2012). The aim of this work was to study the germination and inactivation of A. acidoterrestris spores induced by moderate HP and the effect of different factors, such as pressure, temperature, time, mode of pressure application, type of medium and soluble solids content in apple juice, on this process. Knowledge of factors that promote the germination step may lead to the increased lethality of HP treatments on bacterial spores. Tested organism. The A. acidoterrestris strain TO-117/02 used in this study was isolated from Polish concentrated apple juice, using the International Federation of Fruit Juice Producers’ method. Confirmation of A. acidoterrestris was based on the utilization of erythritol, with acid production (Baumgart, 2003) and guaiacol production in YSG medium with vanillic acid (Niwa and Kawamoto, 2003). Identification at the species level was also performed by 16S rRNA gene sequencing and 16S rRNA gene RFLP characterization (Dekowska et al., 2013). This strain was chosen from among eight wild strains as highly resistant to HP in our previous study (Skąpska et al., 2012). Spores were produced based on the method described by Massaguer et al. (2002), with some modifications (Sokołowska et al., 2012). Just before the experiments, spores were suspended either in McIlvain buffer solution (mixture of relevant volume of 0.1 molar citric acid and 0.2 molar disodium phosphate) pH 4.0 and pH 7.0 or in apple juice at approximately 6-7 log cfu/ml. Hydrostatic pressure treatment. Treatment was carried out in a high pressure food processor piston type vessel with inner diameter 110 mm, a working volume of 1.5 l, with a maximum operating pressure of 600 MPa (Izopress, Moscow). The pressure-transmitting fluid was distilled water and polypropylene glycol (1:1). The working temperature of the apparatus was 0-50ºC. Pressure of up to 600 MPa was generated in 15-20 s; the release time was 15 s.
Thirteen millilitre samples in polyethylene tubes (Sarstedt®) were exposed to high pressure treatment in a continuous or oscillatory mode with 100, 200, 300, 400 or 500 MPa at a temperature of 20 or 50ºC. Each cycle consisted of 5 min holding time at an elevated pressure and a 5 min pause at atmospheric pressure. The temperature was measured in the transmitting fluid and the increase during compression was 2ºC/100 MPa. For experiments at 70ºC, U 4000/65 (Unipress) apparatus was used. The volume of the treatment chamber was 0.95 l and the maximum pressure 600 MPa. The pressure-transmitting fluid used was also distilled water and polypropylene glycol (1:1). The working temperature of the apparatus ranged from −10ºC to +80ºC. A pressure of up to 200 MPa was generated in 120–150 s; the release time was 2–4 s.
Unpressurized samples were used as controls. The pressurization times reported do not include the come-up and come-down time. The assays were performed using two independent samples from two independent processes. Apple juice. Apple juice concentrate (70.7ºBx, 53.0% sugar, pH 3.1, titratable acidity as malic acid 3.89%), containing no A. acidoterrestris spores, was obtained from the Polish producer. Two-, three- and six-fold dilutions were made from this concentrate with sterile deionized water. If commercial pasteurized apple juice was used (pH 3.4, soluble solids 11.2ºBx), before conducting the experiment it was filtered through a 0.45 µm Millipore® filter to remove possible A. acidoterrestris spores. The soluble solids and pH were measured using a refractometer (MS REF 090L My-Soft) and pH meter (CP-315 ELMETRON). Determination of inactivation and germination of A. acidoterrestris spores. The number of spores surviving the different HP treatments was evaluated immediately after processing and after heat treatment at 80ºC for 10 min. This heat treatment was found not to kill ungerminated spores (data not shown). The spread plate method on BAT-agar (Merck) with incubation for 5 days at 45ºC was used. Limit of detection this method was 1 cfu/ml. Pressure-induced inactivation was the difference between the plate count before and after HP treatment. Pressure-induced germination was the difference between the plate count before HP treatment and after HP followed by heat treatment at 80ºC for 10 min (Black et al., 2007; Nguyen Thi Minh et al., 2010; Vercammen et al., 2012), expressed as log (cfu/ml). Data analysis. An analysis of the variance and Duncan’s multiple-range test, using StatSoft® Statistica 7.1, was used to test the significance of the differences (p < 0.05) between the number of germinated and inactivated spores. The bars on the figures indicate the mean standard deviation for data points. To study the effect of moderate pressure on the germination and inactivation of A. acidoterrestris spores, a temperature of 50ºC was chosen to stimulate germination without causing a thermal pasteurization effect. Low (4.0) and neutral (7.0) pH buffers and real food – apple juice – were used in this part of the study. Germination of spores was observed in all used media (Table I). The highest germination, from 3.14 to 3.75 log, was found in the pH 4.0 buffer within the entire range of applied pressure. Statistically significant (p < 0.05) maximum germination occurred at 200 and 300 MPa in the pH 4.0 buffer. Similar germination was observed in apple juice pressurized at 200 MPa – 3.59 log. Generally the lowest germination was obtained in the pH 7.0 buffer, but the results noted in the pressure range 100-400 MPa did not differ significantly (p > 0.05). 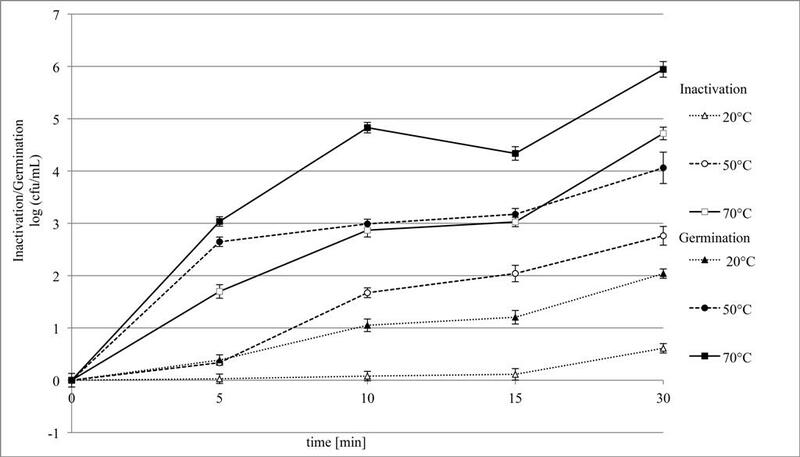 The germination and inactivation of A. acidoterrestris spores under various pressures at low and neutral pH in buffer solutions and commercial apple juice (HP treatment at 50ºC for 20 min). Mean values in columns with different lowercase letters are significantly different at p<0.05, separately for germination and inactivation.Mean values in rows with different capital letters are significantly different at p<0.05, separately for germination and inactivation. Significant (p < 0.05) inactivation, of 1.84-2.04 log, was observed in the pH 4.0 buffer as a result of pressure treatment in the 100-400 MPa range. The level of inactivation in apple juice was similar – a reduction from 1.83 to 1.95 log was achieved in the slightly narrower 100-300 MPa range. Less inactivation occurred at 400 or 500 MPa, A. acidoterrestris spores germinated in the pH 7.0 buffer but were not inactivated during HP treatment. Inactivation only reached 0.24-1.06 log, with a significant maximum (p < 0.05) at 400 MPa (Table I). The results indicate that a low pH supports both the germination and inactivation of A. acidoterrestris spores. In our study the highest germination was achieved when 200-300 MPa in pH 4.0 buffer or 200 MPa in apple juice at 50ºC was used, which is consistent with the results obtained by Vercammen et al. (2012). Considerable inactivation of A. acidoterrestris spores was also achieved in our study. In apple juice in the low pressure window (100-300 MPa), the reduction was significantly higher than at 400 or 500 MPa. Contrary to our results, in the Lee et al. (2002) study there was no significant difference among the effect of 207, 414 and 621 MPa on A. acidoterrestris spore viability at 45ºC in apple juice, a 3.5 log reduction was always observed, irrespective of the pressure used. Yet other results were obtained by Silva et al. (2012) in orange juice. When processed at 45ºC, the inactivation of spores treated with 200 MPa was only about 0.5 log and about 1.0 log, when 600 MPa was used. The different results obtained in the work presented may indicate large variations in pressure resistance among the A. acidoterrestris strains, as well as the influence of the kind of juice, sporulation conditions and equipment used in the various studies. For this study, pressure of 200 MPa was chosen as the best for germination and inactivation of A. acidoterrestris spores in apple juice. As shown in Figure 1, the germination of A. acidoterrestris spores in apple juice depended on the temperature and time. At 20ºC there was little germination and 2.04 log was achieved after 30 min, while inactivation in these conditions achieved only 0.61 log. After 5 min at 50ºC, the degree of germination was 2.65 log, but the spores did not inactivated. Prolonging the time of treatment at 50ºC to 30 min, significantly (p < 0.05) supported both germination and inactivation, which resulted in 4.06 log of germinated spores and 2.76 log of inactivated spores. Fig. 1. Germination and inactivation of A. acidoterrestris spores treated with 200 MPa in commercial apple juice at various temperatures. When HP treatment was conducted at 70ºC, germination was significantly higher (p < 0.05) than at 50ºC for all used pressurization times. Most of the germinated spores were also inactivated at 70ºC. Treatment at this temperature was found not to kill ungerminated spores, but to cause a thermal pasteurization effect on vegetative cells. Approx. 1.7 log of A. acidoterrestris TO-117/02 strain vegetative cells was inactivated after 30 min at 70ºC (data not shown). The highest germination and inactivation were achieved when 200 MPa was applied at 70ºC, which is consistent with the results obtained by other researchers (Silva et al., 2012; Vercammen et al., 2012). Spores of the A. acidoterrestris TO-117/02 strain used in our study showed higher resistance to HP at 70ºC than the strain used by Lee et al. (2002), who observed a complete (> 5.5 log) reduction in apple juice after 5 min treatment with 207 MPa at 71ºC. The higher spore inactivation rate at a higher temperature can be explained by the acceleration of enzymatic reactions during progression from the first to second stage of germination as well as by the fact that first stage germinated spores are directly inactivated by temperatures above 70ºC (Nguyen Thi Minh et al., 2010). Since pressurization conducted at 500 MPa at 50ºC resulted in the lowest germination and inactivation, it was also verified whether an increase in temperature would enhance these processes. A higher process temperature (70ºC) strongly stimulated germination and inactivation at 500 MPa. The germination achieved 6.72 log and inactivation 6.13 log and the increase was significantly higher than at a lower (200 MPa) pressure (Table II). This phenomenon was also observed in tomato juice (Vercammen et al., 2012). Germination and inactivation of A. acidoterrestris spores after 20 min under various pressures and temperature in commercial apple juice. Mean values in columns with different lowercase letters are significantly different at p<0.05, separately for germination and inactivation. Mean values in rows with different capital letters are significantly different at p<0.05, separately for germination and inactivation. Samples of A. acidoterrestris spores in buffer solutions (pH 4.0 and 7.0) and apple juice were exposed to hydrostatic pressure treatment in continuous or oscillatory mode with 200 MPa at a temperature of 50ºC. Each cycle was composed of 5 min holding time at an elevated pressure and a 5 min pause at atmospheric pressure. The degree of germination and inactivation of A. acidoterrestris spores increased when the pressure time was prolonged and the pH decreased (Table III). After 30 min of continuous pressurization with 200 MPa at 50ºC, 3.06 log of spores suspended in pH 7 buffer germinated, but only 0.24 log was inactivated. Germination in a pH 4.0 buffer and in commercial apple juice was higher (3.24 and 4.06 log respectively). In these conditions inactivation achieved 1.79 log in a pH 4.0 buffer and 2.78 log in apple juice. Part of the spore population still remained ungerminated. Germination and inactivation of A. acidoterrestris spores treated with 200 MPa at low and neutral pH in buffer solutions and in commercial apple juice (HP treatment at 50ºC). The results achieved in this part of our study also show that the nutrients present in commercial apple juice can promote the germination of A. acidoterrestris spores during pressurization under moderate HP. The same phenomenon was observed by Vercammen et al. (2012), in tomato juice. Many studies have demonstrated that the application of pressure cycling is more efficient than constant pressure treatment when the total exposure is equivalent (Hayakawa et al., 1994; Furukawa et al., 2000; Sokołowska et al., 2012). Furukawa et al. (2000) concluded that hydrostatic pressure treatment initiated the germination of bacterial spores, and that repeated rapid decompression caused disruption, injury and inactivation of the germinated spores. Nguyen Thi Minh et al. (2010) suggest that after inducing germination of spores under the first pressure treatment, decompression between the pressure cycles favours the progression from first stage to second stage of the germinated spores. The second stage germinated spores are then inactivated by subsequent pressure cycles, which would explain the greater spore destruction by pressure cycling. Recently this statement was disproven by Kong et al. (2014), who observed that spore germination stopped 5 to 10 min after the HP was released. Obtained in those study results suggest that an HP of 150 MPa for < 30 s is sufficient to fully activate spores’ germinant receptors (GRs), which remain activated at 1 MPa but can deactivate at ambient pressure. The results obtained (Table IV) showed that spores germinated after 2 cycles: 2.72 log in pH 4.0 buffer or 3.11 log in apple juice. Germination achieved 3.89 log in pH 4.0 buffer and 4.04 log in apple juice after 6 cycles. Inactivation was also effective and achieved 2.67 log and 2.70 log respectively. These results did not differ significantly (p > 0.05) for both media. Only after 4 cycles germination in apple juice was significantly higher than in pH 4.0 buffer. Germination and inactivation of A. acidoterrestris spores treated with oscillatory pressure 200 MPa at low and neutral pH in buffer solutions and in apple juice (HP treatment at 50ºC). Slightly, but significantly less (p < 0.05) germination was observed in pH 7.0 buffer but inactivation in these conditions was very small. After 6 cycles in pH 7.0 buffer, 3.38 log of spores germinated and only 0.46 log were inactivated. The application of pressure in the oscillatory mode gave a slightly but significantly better effect on the germination and inactivation of A. acidoterrestris spores compared to a continuous process in buffers. In apple juice, the differences were not significant. Inactivation was also low, compared to the results obtained in our previous study (Sokołowska et al., 2012). In those experiments A. acidoterrestris TO-29/4/02 strain was used and inactivation achieved 5.0 log after 6 cycles at 50 ºC with 200 MPa, while 2.8 log inactivation was achieved after 30 min of continuous pressurization. These different results may indicate large variations in the germination process under pressure, among A. acidoterrestris strains. In this study pressure of 200 MPa at 50ºC was used to investigate the influence of soluble solids content in apple juice on the germination of A. acidoterrestris spores. As we expected after previous study (Sokołowska et al., 2013) The baroprotective effect of an increase in the solute concentration in apple juice on A. acidoterrestris spores during high pressure processing was observed (Fig. 2). During 30 min pressurization of spores in concentrated apple juice (70.7ºBx), there was no significant germination and inactivation (p > 0.05). However, in juices with a soluble solids content of 35.7, 23.6 and 11.2ºBx, the spore germination was 2.40, 3.80 and 3.55 log after 30 min. In the same conditions inactivation was 1.51 log, 2.14 and 2.55 log, respectively. The results obtained demonstrate that the effect of high pressure combined with heat, against A. acidoterrestris spores, was highly dependent on the concentration of apple juice. Fig. 2. Germination and inactivation of A. acidoterrestris spores treated with 200 MPa in apple juice with various soluble solids content (HP treatment at 50ºC). Similar results for the inactivation of spores were obtained by Lee et al. (2006). In the case of apple juice concentrate (70ºBx), treatment with high pressure (207, 414 and 621 MPa) at four different temperatures (22, 45, 71 and 90ºC) showed no inactivating effect against the spores of A. acidoterrestris after 10 min of treatment. In diluted apple juice (17.5ºBx) A. acidoterrestris spore reductions was more than 5 log after 10 min at higher temperatures (71 and 90ºC). Increasing spore resistance with a greater soluble solids content may be explained by the lower aw as well as by the protective effect of sugars. At low aw, germination may be incomplete as a result of water deficiency (Black et al., 2007). A baroprotective effect of sugars was also reported for spores (Raso et al., 1998). The results of this study indicate that the treatment conditions, i.e. the level of pressure used and the temperature, time and mode of pressure application as well as, type and pH of the media and soluble solids content in apple juice considerably influenced the germination and inactivation of A. aciodoterrestris spores. These factors should be kept in mind when designing moderate pressure treatments to assure the safety and stability of foods. It was demonstrated that hydrostatic pressure treatment could induce germination and inactivation of A. acidoterrestris spores. A low pH favoured their germination and inactivation while a neutral pH suppressed inactivation. Increasing the process temperature strongly stimulated spore germination and inactivation. When the oscillatory mode was used the degree of germination and inactivation were slightly higher than at continuous mode. The degree of germination and inactivation was inversely proportional to the soluble solids content and was lowest in concentrated apple juice. These results indicate that high inactivation of A. acidoterrestris spores might be possible by HP treatment conducted at a moderately elevated temperature or followed by moderate heat treatment. This would allow better retention of the original properties, nutrients and bioactive components of the juices and make it possible to eliminate these spoilage bacteria. The study was financed by the National Science Centre (Poland) Polish Ministry of Science and Higher Education under via grant No. 2011/01/B/NZ9/02537. Ardia A. 2004. Ph.D. Thesis. Process Considerations on the Application of High Pressure Treatment at Elevated Temperature Levels for Food Preservation. Technical University of Berlin. Berlin. Germany. Alpas H., L. Alma and F. Bozoglu. 2003. Inactivation of Alicyclobacillus acidoterrestris vegetative cells in model system, apple, orange and tomato juice by high hydrostatic pressure. World J. Microbiol. Biotech. 19:619–623. Bahçeci K.S. and J. Acar. 2007. Modeling the combined effects of pH, temperature and ascorbic acid concentration on the heat resistance of Alicyclobacillus acidoterrestris. Int. J. Food Microbiol. 120(3):266–273. Baumgart J. 2003. Media for the detection and enumeration of Alicyclobacillus acidoterrestris and Alicylobacillus acidocaldarius in foods, pp 161–166. In: Corry J.E.L., G.D.W. Curtis and R.M. Baird (eds). Handbook of culture media for food microbiology. Progress in industrial microbiology Vol. 37. Elsevier, Amsterdam. Baumgart J., M. Husemann and C. Schmidt. 1997. Alicyclobacillus acidoterrestris: Vorkommen, Bedeutung und Nachweis in Getränken und Getränkegrundstoffen. Fluss Obst 64:178–180. Bevilacqua A. and M. R. Corbo. 2011. Characterization of a wild strain of Alicyclobacillus acidoterrestris: heat resistance and implications for tomato juice. J. Food Sci. 76(2):M130–M136. Black E., P. Setlow, A.D. Hocking, C.M. Stewart, A.L. Kelly and D.G. Hoover. 2007. Response of spores to high – pressure processing. Com. Rev. Food Sci. Food Safety 6:103–119. Borlinghaus A. and R. Engel. 1997. Alicyclobacillus incidence in commercial apple juice concentrate (AJC) supplies and validation. Fruit Process. 7(7):262–266. Cerny G., W. Hennlich and K. Poralla. 1984. Isolation and characterisation of bacilli cause spoilage of fruit juices (in German). Z Lebensmitt. Untersuch. Forsch. 179:224–227. Danyluk M.D., L.M. Friedrich, C. Jouquand, R. Goodrich-Schneider, M.E. Parish and R. Rouseff. 2011. Prevalence, concentration, spoilage, and mitigation of Alicyclobacillus spp. in tropical and subtropical fruit juice concentrates. Food Microbiol. 28:472–477. Deinhard G., P. Blanz, K. Poralla and E. Altan. 1987. Bacillus acidoterrestris sp. nov., a new thermotolerant acidophile isolated from different soils. Syst. Appl. Microbiol. 10:47–53. Dekowska A., J. Niezgoda and B. Sokołowska. 2013. Genetic diversity of Alicyclobacillus species isolated from Polish fruit juices. Abstract of V International Conference on Environmental, Industrial and Applied Microbiology, BioMicroWorld 2013, Madrid. Spain. p. 216. Durak M.Z., J.J. Churey, M.D. Danyluk, and R.W. Worobo. 2010. Identification and haplotype distribution of Alicyclobacillus spp. from different juices and beverages. Int. J. Food Microbiol. 142:286–291. Eguchi S.Y., G.P. Manfio, M.E. Pinhatti, E. Azuma and S.F. Variane. 2001. Acidotermofilic sporeforming bacteria (ATSB) in orange juices: ecology, and involvement in the deterioration of fruit juices – Report of the Research Project. Part II. Fruit Process. 11(2):55-62. Furukawa S., A. Nakahara and I. Hayakawa. 2000. Effect of reciprocal pressurization on germination and killing of bacterial spores. Int. J. Food Sci. Technol. 35:529–532. Gocmen D., A. Elston, T. Williams, M. Parish and R.L. Housett. 2005. Identification of medicinal off-flavours generated by Alicyclobacillus species in orange juice using GC-olfactometry and GC-MS. Lett. Appl. Microbiol. 40:172–177. Goto K., A. Nishibori, Y. Wasada, K. Furuhata, M. Fukuyama and M. Hara. 2008. Identification of thermo-acidophilic bacteria isolated from the soil of several Japanese fruit orchards. Lett. Applied. Microbiol. 46:289-294. Groenewald W.H., P.A. Gouws and R.C. Witthuhn. 2008. Isolation and identification of species of Alicyclobacillus from orchard soil in the Western Cape, South Africa. Extremophiles. 12:159-163. Hayakawa L., T Kanno, K. Yoshiyama and Y. Fujio. 1994. Oscillatory compared with continuous high pressure sterilization on Bacillus stearothermophilus spores. J. Food Sci. 59:164–167. International Federation of Fruit Juice Producers (IFU). 2006. Method on the Detection of Alicyclobacillus in Fruit Juices. IFU Method No. 12, IFU Paris. Jensen N. and F.B. Whitfield. 2003. Role of Alicyclobacillus acidoterrestris in the development of a disinfectant taint in shelf-stable fruit juice. Lett. Appl. Microbiol. 36:9–14. Kirschke W. and K. Poralla. 1990. Properties of Bacillus acidocaldarius mutants deficient in ω-cyclohexyl fatty acid biosynthesis. Arch. Microbiol. 153:463–469. Komitopoulou E., I.S. Boziaris, E.A. Davies, J. Delves-Broughton and M.R. Adams. 1999. Alicyclobacillus acidoterrestris in fruit juices and its control by nisin. Int. J. Food Sci. Technol. 34:81–85. Kong L., C.J. Doona, P. Setlow and Y. Li. 2014. Monitoring Rates and Heterogeneity of High-Pressure Germination of Bacillus Spores by Phase-Contrast Microscopy of Individual Spores. Appl. Environ. Microbiol. 80(1):345-353. Lee S.Y., H.J. Chung and D.H. Kang. 2006. Combined treatment of high pressure and heat on killing spores of Alicyclobacillus acidoterrestris in apple juice concentrate. J. Food Protect. 69(5):1056–1060. Lee S.Y., R.H. Dougherty and D.H. Kang. 2002. Inhibitory effect of high pressure and heat on Alicyclobacillus acidoterrestris spores in apple juice. Appl. Environ. Microbiol. 68:4158–4161. Luu S. and P. Setlow. 2014. Analysis of the loos in heat and acid resistance during germination of spores of Bacillus species. J. Bacteriol. 196(9):1733-1740. Massaguer P.R., C.P. Pacheco, M.M. Atarassi, W.L. Peña, A.C. Gonçalves, N.A. Paula, L.H. Geraldini, L.L. Liossi, M.R. Gagliazzi and V.A. Guerra. 2002. Sensibility and specificity of methods for Alicyclobacillus detection and quantification: a collaborative study. Fruit Process. 12:478–482. Moir A. 2006. How do spores germinate? J. Appl. Microbiol. 10(3):526–530. McKnight I.C., M.N.U Eiroa, A.S. Sant’Ana and P.R. Massaguer. 2010. Alicyclobacillus acidoterrestris in pasteurized exotic Brazilian fruit juices: isolation, genotypic characterization and heat resistance. Food Microbiol. 27:1016–1022. Niwa M. 2005. Control of hazardous bacteria in acidic beverages by using a guaiacol detection kit (peroxidase method). Fruit Process. 15(6):388–392. Niwa M. and A. Kawamoto. 2003. Development of a rapid detection method of A. acidoterrestris, hazardous bacteria to acidic beverage. Fruit Process. 13:102–107. Nguen Thi Minh H., P. Dantigny, J-M. Perrier-Cornet and P. Gervais. 2010. Germination and inactivation of Bacillus subtilis spores induced by moderate hydrostatic pressure. Biotech. Bioeng. 107(5):876–883. Oteiza J.M., G. Ares, A.S. Sant’Ana, S. Soto and L. Giannuzzi. 2011. Use a multivariate approach to assess the incidence of Alicyclobacillus spp. In concentrate fruit juices marketed in Argentina: Results of a 14-year survey. Int. J. Food Microbiol. 151:229-234. Orr R.V., R.L. Shewfelt, C.J. Huang, S. Tefera and L.R. Beuchat. 2000. Detection of guaiacol produced by Alicyclobacillus acidoterrestris in apple juice by sensory and chromatographic analyses, and comparison with spore and vegetative cell populations. J. Food Protect. 11:1517–1522. Paidhungat M., B. Setlow, W.B. Daniels, D. Hoover, E. Papafragkou and P. Setlow. 2002. Mechanisms of induction of germination of Bacillus subtilis spores by high Pressure. Appl. Environ. Microbiol. 68(6):3172–3175. Parish M.E. and R.M. Goodrich. 2005. Recovery of presumptive Alicyclobacillus strains from orange fruit surfaces. J. Food Protect. 68(10):2196-2200. Pettipher G.L., M.E. Osmundson and J.M. Murphy. 1997. Methods for the detection and enumeration of Alicyclobacillus acidoterrestris and investigation of growth and production of taint in fruit juice and fruit juice-containing drinks. Lett. Appl. Microbiol. 24:185–189. Reineke K., I. Doehner, K. Schlumbach, D. Baier, A. Mathys and D. Knor. 2012. The different pathways of spore germination and inactivation in dependence of pressure and temperature. Innov. Food Sci. Emerg. Tech. 13:31–41. Raso J., M.M. Gongora-Nieto, G.V. Barbosa-Cenovas and B.G. Swanson. 1998. Influence of several environmental factors on the initiation of germination and inactivation of Bacillus cereus by high hydrostatic pressure. Int. J. Food Microbiol. 44:125–132. Setlow P. 2003. Spore germination. Curr. Opin. Microbiol. 6(6):550–556. Silva F.V.M., P. Gibbs, M.C. Vieira and C.L.M. Silva. 1999. Thermal inactivation of Alicyclobacillus acidoterrestris spores under temperature, soluble solids and pH conditions for the design of fruit processes. Int. J. Food Microbiol. 51(2/3):95–103. Silva F.V.M., P. Gibbs and C.L.M. Silva. 2000. Establishing a new pasteurization criterion based on Alicyclobacillus acidoterrestris spores for shelf-stable high – acidic fruit products. Fruit Process. 10(4):138–141. Silva F.V.M., E.K. Tan and M. Farid. 2012. Bacterial spore inactivation at 45–65°C using high pressure processing: study of Alicyclobacillus acidoterrestris in orange juice. Food Microbiol. 32:206–211. Skąpska S., B. Sokołowska, M. Fonberg-Broczek, J. Niezgoda, M. Chotkiewicz and A. Dekowska. 2012. Application of high pressure pasteurization to inactivate spores of Alicyclobacillus acidoterrestris in apple juice (in Polish). Żywność. Nauka. Technologia. Jakość. 3(82):187–196. Sokołowska B., Ł. Łaniewska-Trokenheim, J. Niezgoda and M. Bytońska. 2008. Heat resistance of Alicyclobacillus acidoterrestris spores (in Polish). Przem. Ferm. Owoc. Warz., (12), 22-27. Sokołowska B., J. Niezgoda, M. Bytońska and A. Frankiel. 2010. Biodiversity of Alicyclobacillus acidoterrestris strains (in Polish). Pr. Inst. Lab. Bad. Przem. Spoż. 65:29-32. Sokołowska B., S. Skąpska, M. Fonberg-Broczek, J. Niezgoda, M. Chotkiewicz, A. Dekowska and S. Rzoska. 2012. The combined effect of high pressure and nisin or lysosyme on the inactivation Alicyclobacillus acidoterrestris spores in apple juice. High Press. Res. 32(1):119–127. Sokołowska B., S. Skąpska, M. Fonberg-Broczek, J. Niezgoda, M. Chotkiewicz, A. Dekowska and S.J. Rzoska. 2013. Factors influencing the inactivation of Alicyclobacillus acidoterrestris spores exposed to high hydrostatic pressure in apple juice. High Press. Res. 33(1):73–82. Splittstoesser D.F., J.J. Churey and C.Y. Lee. 1994. Growth characteristic of aciduric sporeforming bacilli isolated from fruit juices. J. Food Protect. 57:1080–1083. Steyn C.E., M. Cameron, and R.C. Witthuhn. 2011. Occurrence of Alicyclobacillus in the fruit processing environment – A review. Int. J. Food Microbiol. 147:1–11. Vercammen A., B. Vivijs, I. Lurguin and C. Michiels. 2012. Germination and inactivation of Bacillus coagulans and Alicyclobacillus acidoterrestris spores by high hydrostatic pressure treatment in buffer and tomato sauce. Int. J. Food Microbiol. 152(3):162–167. Wang Y., T. Yue, Y. Yuan and Z. Gao. 2010. Isolation and identification of thermo-acidophilic bacteria from orchards in China. J. Food Protect.73(2):390-394. Wuytac E.Y., S. Boven and C.W. Michiels. 1998. Comparative study of pressure-induced germination of Bacillus subtilis spores at low and high pressures. Appl. Environ. Microbiol. 64(9):3220–3224.